General manager of football operations Lee O’Neill says the fightback from yesterday's relegation to League One starts now. “The plan is really to work hard and try and get promoted next season, like I’m sure all of you want the same,” O’Neill said at last night’s Player Awards evening in Legends. “It’s not going to be easy. We’re going into unfamiliar territory, a new league with a lot of players. He added: “The fans have been absolutely brilliant and that’s kept us all buzzing. I think the fightback, if it hasn’t started, starts now and we’ll stay positive right to the end of the season and the guys will try and put on as much of a performance as they possibly can in the remaining games. O’Neill, who is live on Mark Murphy’s BBC Radio Suffolk show on Monday morning from 8am, also spoke to the club site following yesterday’s game. well i hope your right lee! the more and more i think about town in league one next season worries me. only time will tell i guess, but we need to strengthen, especially up front. im trying to remain positive and hope we can bounce back. wonder who we will let go/sell to balance the books? I wouldn’t expect to hear anything else but, and it’s a big but, what happens next season is down to Evans! Reading between the lines of Evans statement we can expect more of the same from him, no meaningful investment in the squad and just hoping something will turn up, so already we are on the back foot for next season. I really fear for our future whilst this man remains our owner. Expect more and more of these interviews over coming days, weeks. All saying a lot, but meaning very little. So far heard from the big 2, nothing’s inspired me so far. Are we going hell for leather on a serious promotion push or not? What I’ve heard so far is half hearted at best. 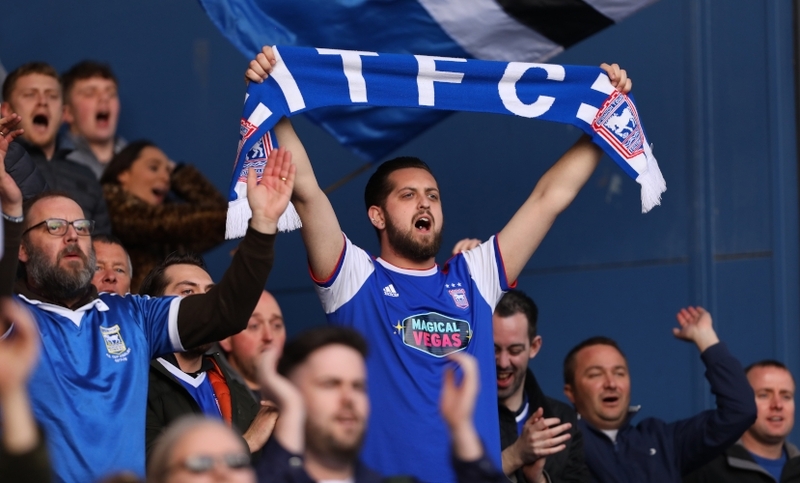 Again disbelief : if theses saddles really are so poorly served by ITFC then clear off and soon — go and find another football club to pledge your so called allegiance to ! Come on , if you want to spend your time and money supporting the Town , then please do so ! If, as is understandable , frustration surfaces, then sit down , list your criticisms ,structure a critique BUT put forward objective observations ,backed by sensible grounded reason ,and please remain ,as we want our side to do, on the front foot !! Just want to say that it is going to be very hard next season and we will need all fans to be behind the team from the start. We gave had too much negativity all season. The fans response at the end of yesterday's game was brilliant and I have to admit I did have a tear in my eye. We must start the new season on the front foot and the owner must reduce prices all round and give PL as much backing in thr transfer market as is needed. We cannot play a team full of youngsters that will be suicidal. So let's gets behind the team 100%. I'm pleased to hear it is our intention to try and win promtion next season. Most reassuring. Blueinberks. Yes there is a huge difference. But saying that, our current squad is a average L2, in terms of quality. That’s the reason we are and will finish so far from everybody else. The guy from tranmere for me would be a great place to start, can score with either foot and is the kind of player you would hate playing against. Just do it, the time for talking has finished! Have some fans still not grasped the simple fact that Evans is only permitted to invest a certain amount if money each season as per FFP rules. He does invest up to that level, and is not allowed to put anymore money in than that. Having already been in administration, Town would suffer severe penalties if it did not follow these levels of finance ( as per FFP). I was hoping to read something about a bit of investment, but I would imagine the reason neither of them are banging on about getting a goal scorer for next year, is probably the same reason Keane hasn't even been on the bench the last 3 weeks.... We'd like to have him, but don't want him putting his value up/ getting an extension at parent club. If Keane 'really is still injured' after 3 weeks of PL saying he may be fit for the next game, then I'd suggest look elsewhere. I've liked what I've heard from Lee O'Neill so far, but this interview worries me. Just sounds like more of the same old Evans spin to me, a handful of meaningless platitudes straight out of the PR textbook. Desperately hoping that O'Neill doesn't just turn out to be the latest mouthpiece off the Clegg-Milne production line. Don't take us for mugs Marcus, it's starting to wear thin. We need a goalie who can dominate the box, a couple of centre backs with physical presence no nonsense approach and 2 strikers. Have we got the money to be competitive next season? ArnieM Me puts in well under FFP rules which allow for 39 mil over 3 years period , ME puts in a reported 6-7 ml per year , so well under. And even then Brum and QPR openly flouted the rules , got done , yet did it again regardless..and Birminghams as case in point got 9 points deducted..that was it.! !..FFP is pathetic , and the penalties given are not in proportionate in any way. ArnieM ----- you're absolutely right - therefore good recruitment, clever coaching, and good Management - as in the Team are all important, and instrumental for success. Just look at Carrot Road..... !! Consecutive failed Managers are responsible for our demise, more so than an Owner, who has recruited in line with most peoples expectation, however these appointments generally haven't worked. A huge mistake by the Owner was when he removed Jim Magilton, it's been progressively downhill since then. Evans has made some mistakes, which he admits, but his actions / appointments have been in the best interests of our Club (of which most of us would have agreed at the time) - hindsight can, and always will be a wonderful thing. "A new league with a lot of players." Can't fool him. one of the first moves we should make is getting Danny Rowe back, he's never had a proper chance and i think he could be very good for Town !! ArnieM, please don't write such lies, especially when you really do not know what you are talking about. It is far fairer to say that Marcus Evans puts as little into this football club as he can get away with, but he is certainly NOT encumbererd by FFP rules. He would have had to inject £30m more than he actualy did in the last 3 years to come anywhere near to breaking FFP rules! The real problem with Marcus Evans is not necessarily how little cash he injects, but his poor decision making. We desperately need an experienced MD and DoF to make the better decisions for him. He has to say something to sell Season tickets, I hope we sell a lot - but if we do it will be down to the end of season camaraderie that Lambert and the fans have engineered in the face of this disaster rather any real belief that the current players are good enough or that Evans will invest to make the squad better.